Find the brands you love at prices that work for you at T.J.Maxx. W e believe everyone deserves to be surrounded by beautiful, high quality, on-trend things at incredible savings. Fashion, family, home – we have just what you need to help maximize what matters most to you. 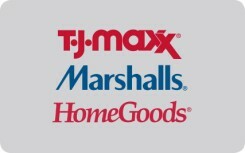 Maxx life with a TJX Gift Card –redeemable at T.J.Maxx, tjmaxx.com, Marshalls, and HomeGoods (in the U.S. and Puerto Rico). T.J.Maxx, Marshalls, and HomeGoods are not affiliated with Swagbucks and are not sponsors or co-sponsors with this promotion. Use of T.J.Maxx, Marshalls, and HomeGoods’ names, logos, images, or trademarks require written approval from TJX Incentive Sales, Inc. Participation by T.J.Maxx, Marshalls,and HomeGoods in the program is not intended as, and shall not constitute, a promotion or marketing ofthe program by T.J.Maxx, Marshalls, and HomeGoods, The TJX Companies, Inc, or any of its subsidiaries or affiliates.